Philip Kerr, Lord Lothian (1882-1940), is today gaining an increasing interest from historians and political scientists. The main reason for this revival of study is that Lothian started his political career as a Milnerite imperialist only to become a prominent international federalist. In fact Lothian's thought and action is an expression of that historic process which transformed the European system of states into a world one. Lothian was one of the few Britons who clearly understood the direction of that process as soon as it started, showing its first premonitory signs during the course of the First World War, and who tried to promote a progressive solution to the crisis of Europe. After having actively taken part in the process of South African unification during the initial years of the century, and tried in vain to transform the British Isles and the Empire into a federation through the Round Table Movement, Lothian, as Private Secretary to Lloyd George in Paris in 1919, was one of the architects of the Versailles Peace settlement. Later, after having abandoned, in 1921, the lights of political arena he become the most prominent advocate in Europe of the cause of a lasting peace on the basis of Atlantic Union. During this twenty-years period of lecturing and writing, Lothian also gave his contribution to the creation of the Indian Federation, become one of the most influential advisers of British foreign policy, and in 1939 took part into the formation of the Federal Union Movement, the first European federalist movement organised on popular basis. Finally, appointed British Ambassador to the United States, gave a fundamental contribution to the achievement of the destroyers-bases agreement and the policy of the lend-lease, thus bringing in early 1941 the United States on the edge of a non-declared war against Nazi Germany. 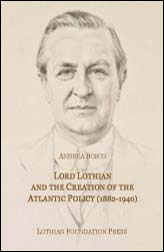 This volume is the most comprehensive and accurate biography of Lord Lothian available today. Andrea Bosco is holder of a Jean Monnet "ad personam" Chair in history and theory of European unification at the University of Florence. Among his publications: The Federal Idea, Vol. I, Vol. II (1992); Chatham House and British Foreign Policy, 1919-1945 (1995); The Tound Table, the Empire/Commonwealth and British Foreign Policy (2000); �mile No�l: A Life for Europe (2009); Federal Union e l'Unione franco-britannica. Il dibattito federalista nel Regno Unito dal Patto di Monaco al crollo della Francia, 1938-1940 (2009).